Delighted to start with Georgina Adam’s recent Dark Side of the Boom. 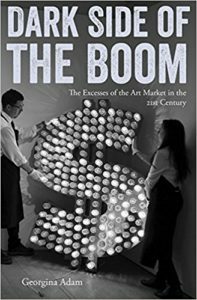 The Excesses Of The Art Market In the 21st Century, an essential book for those interested in the relationship between art and money. “This book scrutinizes the excesses and extravagances that the 21st-century explosion of the contemporary art market brought in its wake. The buying of art as an investment, temptations to forgery and fraud, tax evasion, money laundering and pressure to produce more and more art all form part of this story, as do the upheavals in auction houses and the impact of the enhanced use of financial instruments on art transactions (…) With the same captivating style of her bestselling ‘Big Bucks: The Explosion of the Art Market in the 21st Century’, Georgina Adam casts her judicious glance over a section of the art market whose controversies and intrigues will be of eye-opening interest to both art-world players and observers.” (2017, Lund Humphries). Coming soon in French, Italian and Chinese.